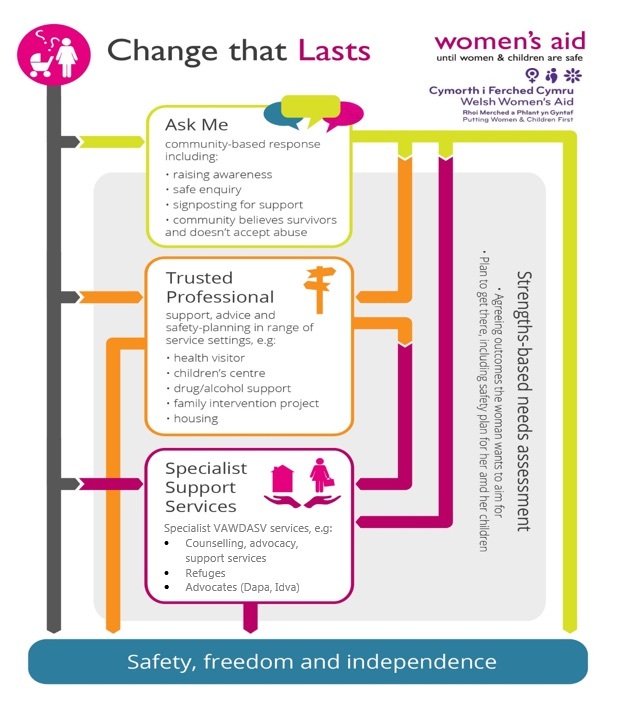 Change that Lasts is a new strengths-based, needs-led approach that supports survivors of all forms of violence against women, and their children, to build resilience, and leads to independence. Sustained independence and freedom – work together for an independent future for survivors. For many women, when they first disclose they are experiencing abuse they are not given a supportive response. No one consults them about how best to help make them safer, despite the fact that nobody knows the perpetrator better than they do. Often women who disclose abuse are assessed by professionals for risk, which then determines what level of support they are given, and often those assessed at lower risk are offered a lower level of support. We believe that with risk being the indicator or gateway to support, women are getting a less tailored package of support and then struggle to escape the abuse permanently. We want to change that and ensure that support is offered based on a women’s needs and that builds on her strengths and resources available to her so that she can build her independence, recover from the trauma she has experienced and get her life back. Our decades of experience working with survivors, and the evidence of research, have taught us a better way. By listening to women we can provide help earlier and make sure its effects actually last. ‘Change that Lasts’ is a new approach that places the survivor at the heart and builds responses around her needs and the strengths and resources available to her. Too often this approach is considered too complicated and too expensive. So to make it clearer, we have created some infographics, visualising these women’s journeys, and the journeys they could have taken. These illustrate the enormous cost, in human and financial terms, of not listening to women and responding to their needs. We’re going to keep advocating for a response to all forms of violence against women that has women at its centre. Read Sarah, Katrina and Yasmin’s stories below. provide specialist support to survivors that is tailored to their needs, builds on their strengths, and is trauma informed. Communities are often the first to know about abusive relationships so the ‘ask me’ scheme aims to maximise communities’ understanding by providing a 2 day training course on how to break the silence and raise awareness of violence against women and girls. They will also be equipped with the tools and confidence to respond appropriately to survivors should they chose to share their experiences. This is a 1 day training course designed to upskill professionals who have contact with potential survivors and/or perpetrators of violence against women, domestic abuse and/or sexual violence to ‘recognise the signs, respond to disclosures and refer to specialist support services. This strand of the model aims to maximise the specialist support services response to women impacted by violence and abuse, by allocating resource to services to introduce/develop/review tools to support women with a needs-led, strengths-based, gender-informed and trauma-informed approach in order to achieve lasting change and improved wellbeing for women. In 2017-18 Welsh Women’s Aid, in partnership with Women’s Aid (England), successfully piloted the ‘ask me’ strand of the ‘Change that Lasts’ model in Powys, supported fully by our member’s Montgomery Family Crisis Centre and Calan DVS. See the impact here. Following on from the success of the pilot of ‘ask me’, Welsh Women’s Aid have secured funding for various ‘Change that Lasts’ projects across Wales. Please click on each region below to see how ‘Change that Lasts’ is operating in each area.